Ignores any stat changes in the Pokémon. X Il aime le calme des montagnes. Son ouïe exceptionnelle entendrait une aiguille tomber à 1 km. X Su oído es tan agudo que puede oír una aguja caer a 1 km. Vive en montañas solitarias. X Ha un udito tanto acuto da sentire la caduta di uno spillo a 1 km di distanza. Vive su monti quieti. X 1km 전방에 떨어진 바늘 소리도 분간할 수 있는 우수한 귀를 가지고 있다. 조용한 산속에 살고 있다. Y Ce Pokémon est une sorte de petite fée très rare. Il court vite se cacher s’il aperçoit un être humain. Y Un encantador y tímido Pokémon muy raro de ver. Corre y se oculta en cuanto siente que viene gente. Y Timido Pokémon Fata, molto raro a vedersi. Scappa e si nasconde non appena avverte la presenza umana. Y 요정의 동료로 좀처럼 사람 앞에 나타나지 않는다. 기척을 느끼면 바로 도망가는 듯하다. Omega Ruby Clefable moves by skipping lightly as if it were flying using its wings. Its bouncy step lets it even walk on water. It is known to take strolls on lakes on quiet, moonlit nights. Omega Ruby Pixi bewegt sich fort, indem es leicht mit den Flügeln schlägt. Durch seinen federnden Gang kann es sogar über Wasser gehen. Bei Mondschein unternimmt es Spaziergänge auf Seen. Omega Ruby Les Mélodelfe se déplacent en sautant doucement, comme s’ils volaient. Leur démarche légère leur permet même de marcher sur l’eau. On raconte qu’ils se promènent sur les lacs, les soirs où la lune est claire. Omega Ruby Clefable se mueve dando saltitos como si fuera haciendo uso de las alas. Estos pequeños brincos le permiten caminar por el agua. De todos es sabido que le encanta darse paseos por los lagos en tranquilas noches de luna llena. 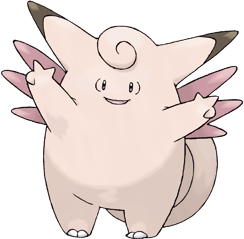 Omega Ruby Clefable si muove saltellando leggero come se fluttuasse sorretto dalle sue ali. Così riesce anche a camminare sull’acqua. È solito passeggiare sui laghi in silenziose notti di luna piena. Omega Ruby 날개를 사용하여 날아가듯 뛰어간다. 물 위를 걷는 것도 할 수 있다. 조용한 달밤에 호수를 걷는다. Alpha Sapphire Clefable moves by skipping lightly as if it were flying using its wings. Its bouncy step lets it even walk on water. It is known to take strolls on lakes on quiet, moonlit nights. Alpha Sapphire Pixi bewegt sich fort, indem es leicht mit den Flügeln schlägt. Durch seinen federnden Gang kann es sogar über Wasser gehen. Bei Mondschein unternimmt es Spaziergänge auf Seen. Alpha Sapphire Les Mélodelfe se déplacent en sautant doucement, comme s’ils volaient. Leur démarche légère leur permet même de marcher sur l’eau. On raconte qu’ils se promènent sur les lacs, les soirs où la lune est claire. Alpha Sapphire Clefable se mueve dando saltitos como si fuera haciendo uso de las alas. Estos pequeños brincos le permiten caminar por el agua. De todos es sabido que le encanta darse paseos por los lagos en tranquilas noches de luna llena. Alpha Sapphire Clefable si muove saltellando leggero come se fluttuasse sorretto dalle sue ali. Così riesce anche a camminare sull’acqua. È solito passeggiare sui laghi in silenziose notti di luna piena. Alpha Sapphire 날개를 사용하여 날아가듯 뛰어간다. 물 위를 걷는 것도 할 수 있다. 조용한 달밤에 호수를 걷는다. Sun They don’t like to reveal themselves in front of people. They live quietly in packs deep in the mountains. Moon According to tradition, people who see a pair of Clefable skipping by can look forward to a happy marriage. Red A timid Pokemon that is rarely seen. It will run and hide the moment it senses people. Blue A timid Pokemon that is rarely seen. It will run and hide the moment it senses people. Yellow They appear to be very protective of their own world. It is a kind of fairy, rarely seen by people. Stadium Its ears are very sensitive, so it does not like loud noises or busy places. Will not come out in front of people. Gold With its acute hearing, it can pick up sounds from far away. It usually hides in quiet places. Silver It's very sensitive ears let it distinguish distant sounds. As a result, it prefers quiet places. Crystal Said to live in quiet, remote mountains, this type of fairy has a strong aversion to being seen. Stadium2 With its acute hearing, it can pick up sounds from far away. It usually hides in quiet places. 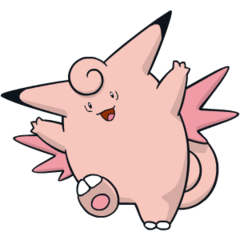 Ruby Clefable moves by skipping lightly as if it were flying using its wings. Its bouncy step lets it even walk on water. It is known to take strolls on lakes on quiet, moonlit nights. Sapphire CLEFABLE moves by skipping lightly as if it were flying using its wings. Its bouncy step lets it even walk on water. It is known to take strolls on lakes on quiet, moonlit nights. Emerald A CLEFABLE uses its wings to skip lightly as if it were flying. Its bouncy step lets it even walk on water. On quiet, moonlit nights, it strolls on lakes. Pearl Its hearing is so acute it can hear a pin drop over half a mile away. It lives on quiet mountains. Platinum It is very wary and rarely shows itself to people. Its ears can hear a pin drop over half a mile away. Black It is very wary and rarely shows itself to people. Its ears can hear a pin drop over half a mile away. White It is very wary and rarely shows itself to people. Its ears can hear a pin drop over half a mile away. Black 2 Their ears are sensitive enough to hear a pin drop from over a mile away, so they’re usually found in quiet places. White 2 Their ears are sensitive enough to hear a pin drop from over a mile away, so they’re usually found in quiet places.